Weird, huh? Or was it all part of some sort of devious marketing plan...? 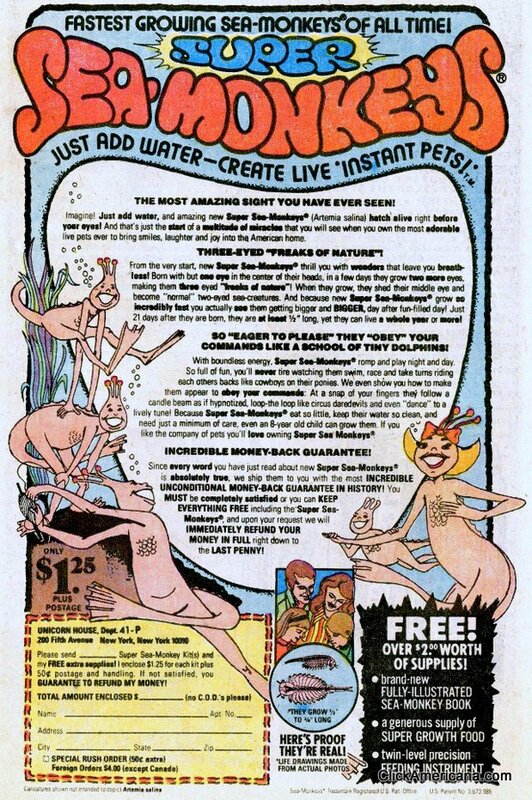 Was this one-and-only story written by the mysterious Lois Maiwald inspired by those kooky Sea Monkey ads that ran in our comic mags for oh, so many decades? Aw, great! Now Ol' Groove needs closure! Sigh...well, let's try to reign in our feelings and enjoy the cool story and fab-a-mundo E.R. Cruz art! I was likewise curious about that story. Thanks so much for posting it! DC's horror line was my favorite thing they put out. Ha! That's brilliant. A Sponge who lives in a pineapple under the sea. Belated thanks! I enjoyed it. Thanks Groove - they don't make 'em like that anymore.